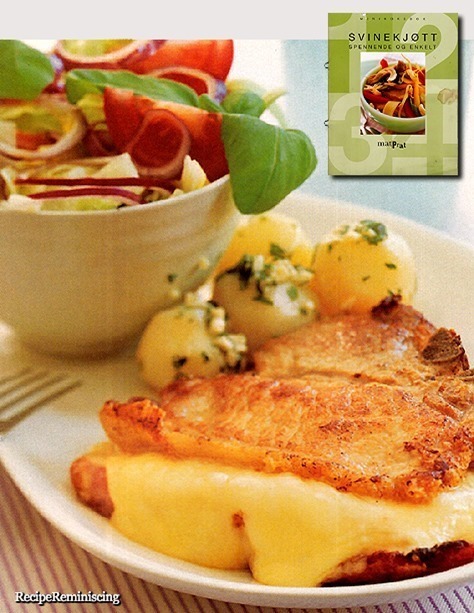 This piquant cheese cream works very well as a completion of a meal. 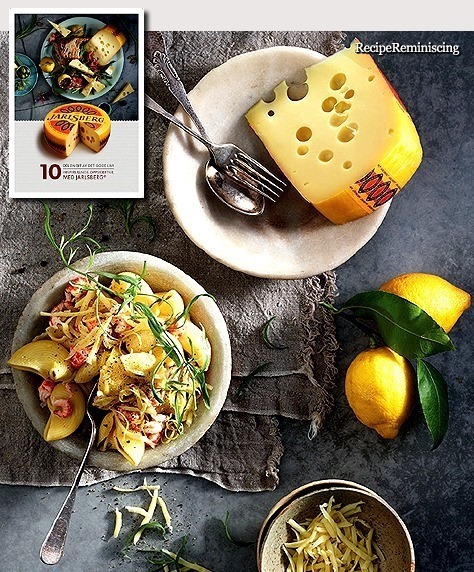 Jarlsberg (Norwegian pronunciation: [²jɑːɭsbærɡ];English: /ˈjɑːrlzbɜːrɡ/ ) is a mild cow’s-milk cheese with large regular holes, that originates from Jarlsberg, Norway. Although it originated in Norway, it is also produced in Ohio and Ireland under licenses from Norwegian dairy producers. Jarlsberg cheese has a yellow wax rind (outer layer) and a semi-firm yellow interior. It is a mild, buttery cheese. The flavor has been described as “clean and rich, with a slightly sweet and nutty flavour”. 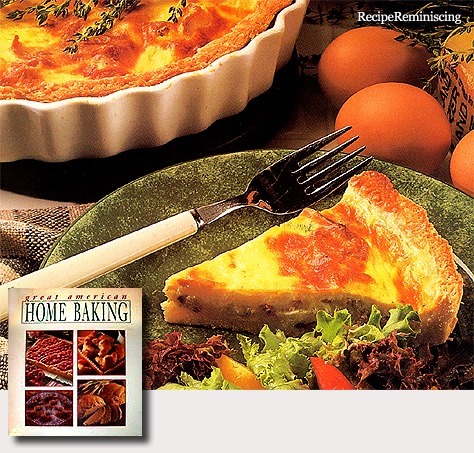 It is an all-purpose cheese, used for both cooking and eating as a snack. It has a characteristic smooth, shiny-yellow body, and a creamy supple texture. It is aged a minimum of one year and is distinguished by medium to large holes. It is usually produced in 10 kg wheels with an approximate diameter of 330 mm and a height of 95-105 mm. The characteristic holes or “eyes” are the result of the action of the bacteria Propionibacterium freudenreichii which naturally occurs in milk and is added back to the cheese during production according to a closely guarded secret formula. The history of this cheese can be traced back to the middle 1850s. Anders Larsen Bakke (1815–1899), a farmer and pioneer in Norway’s dairy industry, produced cheese in the village of Våle in what was then the county of Jarlsberg and Larviks Amt (now Vestfold), 80 km (50 mi) south of Oslo. 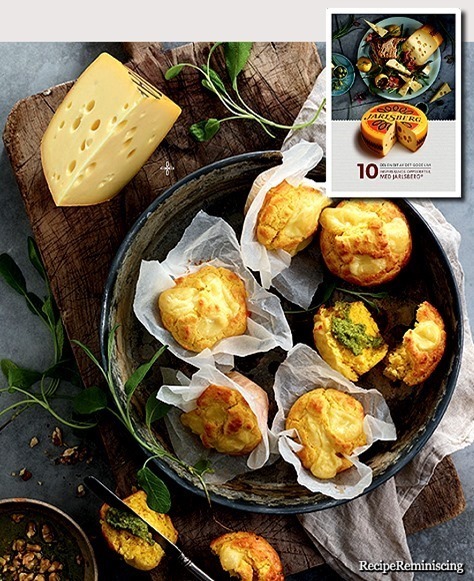 The cheese shares similarities with Emmental, introduced to Vestfold by Swiss cheese makers during the 1830s. The cheese was first noted in the annual county report of Jarlsberg and Larviks Amt in 1855. 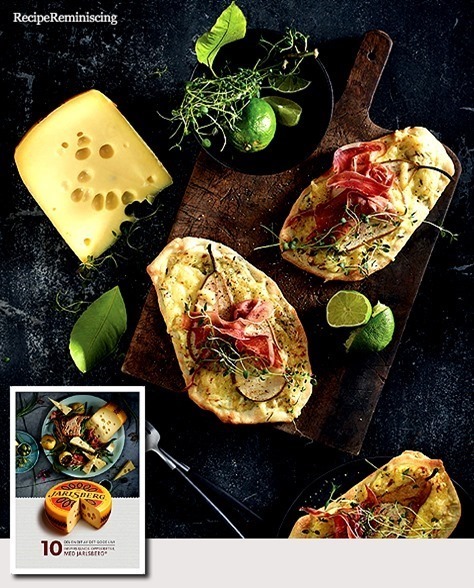 After several years of popularity marked by a large volume of production Jarlsberg disappeared from the market. 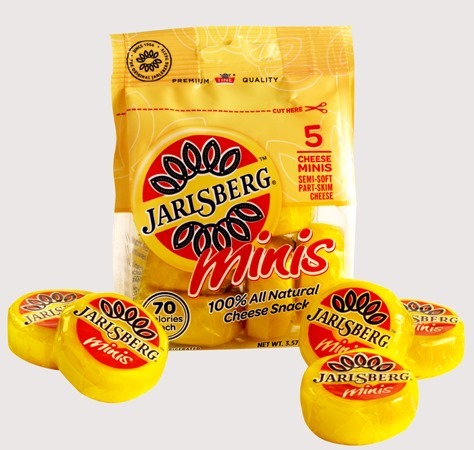 Modern Jarlsberg cheese was developed in 1956 by Ole Martin Ystgaard of the Dairy Institute at the Agricultural University of Norway. Ystgaard’s interest was sparked by the thesis of a dairy sciences student, Per Sakshaug, on the cheese historically made in Vestfold. It was named for a Norwegian nobleman Count Wedel Jarlsberg (or the eponymous county) who owned land near Oslo in an area where an earlier version of the cheese was produced in the early 1800s. 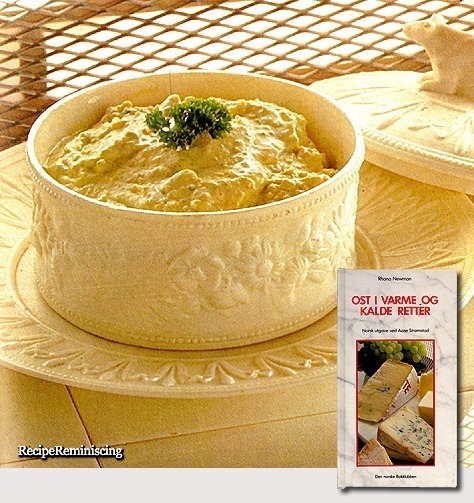 The recipe was developed from formulae originating with Swiss cheesemakers who moved to Norway in that time. White mini pizzas with crème fraiche, Serrano ham, pear and thyme. 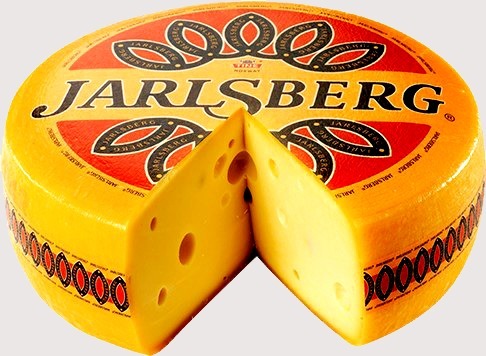 Jarlsberg is a light yellow semi-hard rennet cheese (Swiss cheese) with characteristic large holes. The origin is controversial. Some sources can tell that the rennet originally was developed by Anders Larsen Bakke (1815-1899) on Østre Bakke farm in Våle in Vestfold, Norway. On the other hand, ads for Jarlsberger cheese were printed in Norwegian papers as early as in the first half of the 1820s. Jarlsberg cheese is a gautal cheese which is an intermediate between emmentals (Swiss cheese) and Gauda.